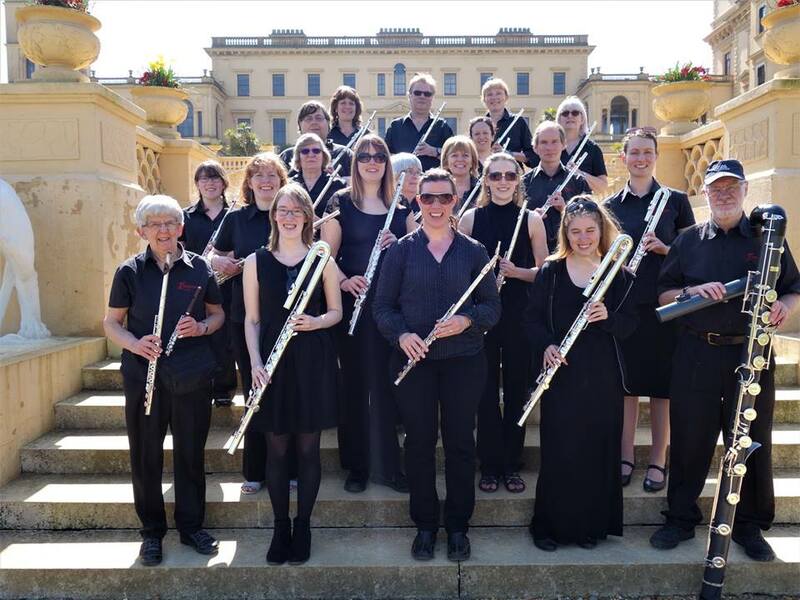 Flautissimo is a friendly and enthusiastic group of around 40 flute players of all ages drawn from all over Hampshire that meets weekly on Friday evenings during term time to rehearse exciting repertoire to a high standard for public performances. Please get in touch if you would like to join Flautissimo (Grade 5+) or our training choir Piccolissimo (for those who can play some notes and read music, up to Grade 4). We are known as a flute orchestra as our group produces a complex and attractive sound using a full range of the members of the flute family, from the piccolo and concert flute to the less familiar alto, bass, and contrabass flutes. Flautissimo is a partner of both the Southampton and Hampshire Music Hubs. These Hubs are networks of local and national organisations that work collaboratively to provide a range of musical activity for all children and young people in Southampton and more widely across Hampshire. The activities provided by the Hubs include music lessons in the form of weekly instrumental and vocal tuition; concerts; special events; family music making; workshops and holiday courses. Our flute choirs perform a range of concerts every year in a variety of settings: from our regular performance at the Southampton Art Gallery as part of the Music in the City festival in the autumn, participation by invitation in regional concert series, performing at Winchester Cathedral's Christmas Market, and a summer bandstand performance in Romsey, along with taking smaller groups to perform at open gardens, private and corporate events and the Southampton Mela. These are interspersed with formal and informal concerts with other groups at local churches, the Turner Sims, Romsey Abbey, and elsewhere in Hampshire. As well as local performances, the group regularly perform at BFS International Conventions, and have toured to Edinburgh, Cornwall, and Dublin, and Cardiff. In Spring 2018 we shall toured to the Isle of Wight, giving performances at venues such as Osborne House and Carisbrooke Castle. In 2012 the group participated in the Adopt a Composer scheme and premiered a new work by Lithuanian composer Ruta Vitkauskaite which was broadcast on BBC Radio 3. Flautissimo is a charity run by its Committee which is appointed from Flautissimo's members. Flautissimo seeks to advance, improve, develop and maintain public education in, and appreciation of, flute playing in Southampton and Hampshire, for example by providing opportunities for flute players to develop their ensemble skills, and by giving concerts and recitals. As a charity we welcome donations, charitable gifts, and offers of sponsorship. Bookings: Flautissimo has often been asked to perform at weddings, garden parties and other occasions: for example Flautissimo has previously performed at the Mayor of Eastleigh's Appeal, and subsequently was invited to take a flute quintet to play for the Mayor and his guests at a private function. Please contact us if you would like to book Flautissimo to perform at your function or in your concert. Join us: If you enjoy playing the flute then Flautissimo is the place for you! New flautists are always welcome, anyone of Grade 5 standard or higher is warmly encouraged to join Flautissimo. Beginners and anyone whose flute playing is a little rusty should consider coming to Piccolissimo, our flute choir for less experienced flautists. We often participate in and encourage our players to attend local flute weekends with leading performers, teachers and composers such as Ian Clarke, Wil Offermans, Clare Southworth, Katherine Bryan, Lisa Nelson, Trevor Wye, Anna Noakes, Mike Mower, Peter Verhoyen, Abbie Burrows, Andy Findon, Gareth McLearnon, Niall O'Riordan and Paul Edmund-Davies.